OA18 (Figure 150) continues to be bounded to the north by ditch 25015 (Group 777), though this boundary is supplemented or replaced by a fenceline during Period 4. No replacement or upkeep of its roadside boundaries is apparent and it is assumed that the enclosure is open along its frontage with Roads 1 and 2. It is not clear whether or not the enclosure interior is still subdivided, as in Period 3. 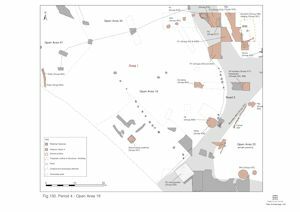 Given that most of the Period 3 buildings and other structures pass out of use and are not seemingly replaced, it is likely that it reverts to a single entity. Together with the appearance of pits and increased presence of maddening, a change of use may be inferred. 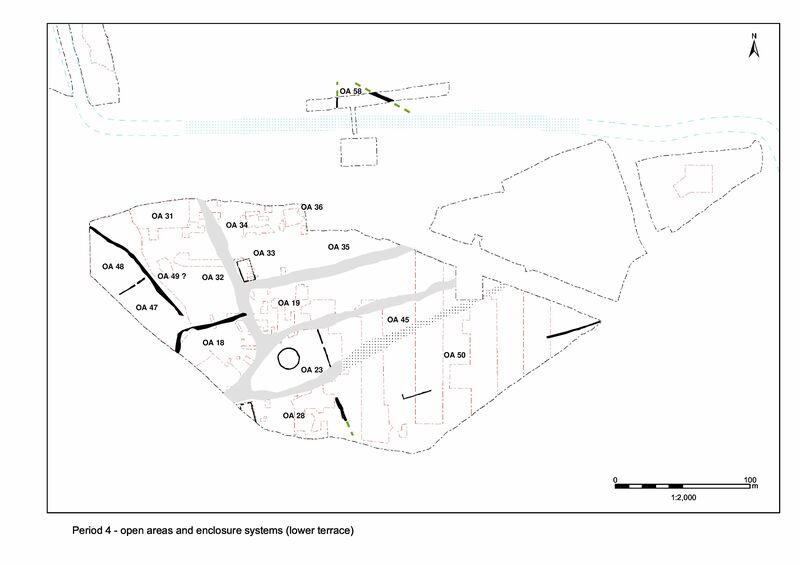 It is curious that the Period 3B monumental post is removed late in this period, broadly corresponding with the erection of a similar post within the temple precinct. It is tempting to speculate that this could represent its relocation, though there is no tangible evidence to support this. The establishment of a well within OA18, at the Road 1 frontage may be part of this change of use - which may have been domestic in nature. 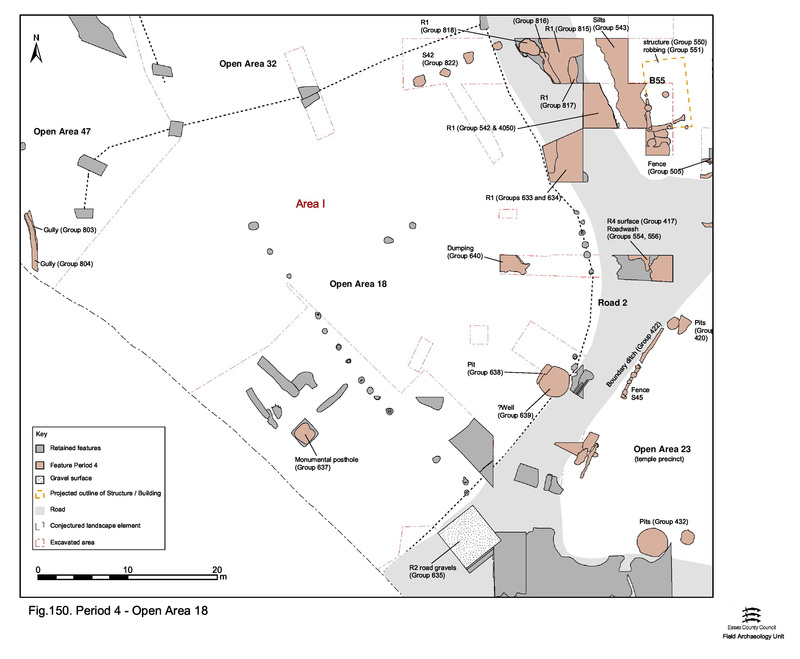 The northern boundary of Open Area 18 is redefined during Period 4, although no marked change in pre-existing alignments is noted. A line of four, similarly proportioned, sub-square, clay-lined post-holes (10384, 10518, 10585, 10745), regularly spaced at intervals of 3.4m, lie on an ENE-WSW alignment. Square post-pipes are evident in three of the post-holes and the fourth, 10745, is probably similar but is heavily truncated, thus obscuring any evidence. A further, unexcavated, clay-packed post-hole is recorded on the pre-excavation plan of this area, some 10m to the west. These features are interpreted as the remains of a fenceline that probably runs off to the south-west, away from the edge of Road 1. It is likely that it either supplements and eventually replaces Period 3C boundary ditch 25015 and, as such, maintains the division between Central and Northern Zone enclosures at this point. This boundary is later re-cut/re-established by ditch 25027 (Group 838 Period 5), the remains of which truncate the Structure 42 post-holes. 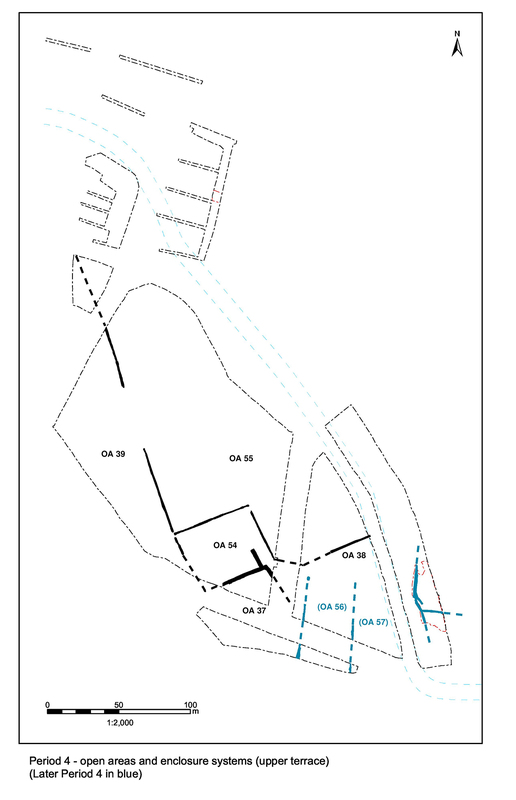 The pre-excavation plan also shows a gully that runs parallel with this general boundary, some 2m to its south. However, it is not possible to determine whether it is associated with the fence or the earlier or later ditches. Pottery from post-hole 10384 provides a mid-2nd century+ AD date, while that from the post-pipe within 10518 is probably 3rd century. Where dark silt upper fills exist above clay linings, they contain 4th century material. It is likely that these fills were in fact part of the overlying ditch fills and, on balance, a mid-Roman date can be assigned to the fenceline. Within OA18, a number of shallow, circular to oval, pits cut the Period 3 dump layers without penetrating the underlying Period 2B gravel surface. All are located towards the peripheries of the plot, in contrast to earlier pits, and they do not seem to represent a major episode of activity. The Period 4 pits within Open Area 18 are included in Group 641 (13138, 13158, 18357) with the exception of 5829 (Group 638), which is distinguished from the remainder because it pre-dates well 5806 (Group 639). Finds assemblages from the majority of these pits are not particularly large or varied, apart from significant quantities of tile. All appear to comprise principally domestic rubbish. However, pit 13158 is notable for its greater variety of materials and the inclusion of both slag and lead cast waste (SF3522, SF8392) and copper alloy and iron fragments. The presence of two coins (SF6474, SF6475) in small and isolated pit 18357 may be significant. 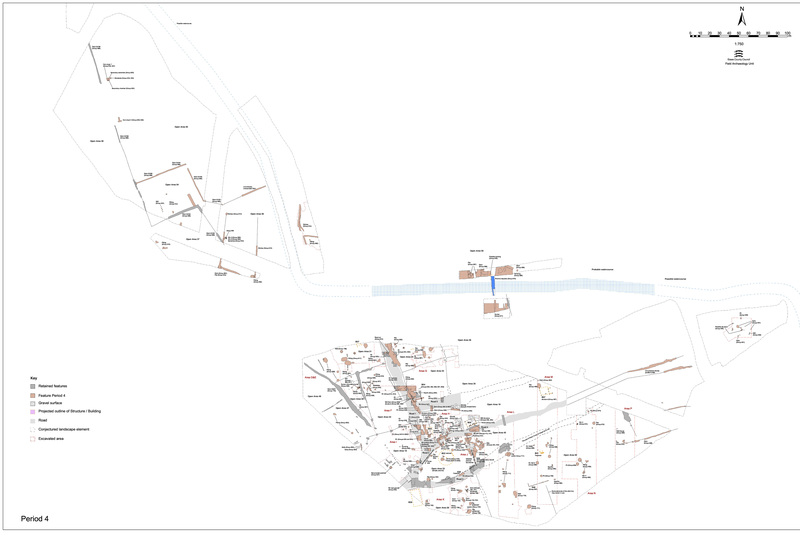 Period 4 pit 13138 cuts an episode of mid-Roman middening located on the eastern side of Open Area 18 and surviving as a sequence of two large dumps 13146 and 13211 (Group 640). Their surviving components are composed almost entirely of oyster shell, but may originally include other organic rubbish. They are separated from one another by a thin layer of sand, 13204, which may be a deliberate capping deposit over the earlier dump. The full extent of this midden is not determined as it extends beyond the limits of the excavated trench, but it is clearly in excess of 3m diameter. It would appear that the discard of oyster shell is its primary use; over 100kg of oyster shell is present in contrast to very small amounts of animal bone, pottery and a single iron nail. The monumental post 13331 (Group 617), erected in Period 3B, continues to stand in OA18 until the mid-3rd century, at which point irregularly shaped pit 13433 (Group 637) is cut into the clay packing deposit around the foot of the post. It is dug to a depth of 0.5m in order to facilitate the removal of the post. The surviving post-clast is splayed, probably as a result of attempts to loosen the post. This resultant robber cut is infilled with silts containing modest amounts of pottery, tile, animal bone and a few ironwork fragments; not significantly different from other pits of this date in the area. In the eastern part of OA18, well 5806 is cut through the Period 3B dump deposits. This roughly circular feature is the largest in the enclosure, at approximately 3.5m diameter. Owing to severe waterlogging at the time of excavation, the vertical-sided cut is not bottomed, but is established to be in excess of 0.5m deep. Its excavated lower fills are fine silts, clayey at the bottom and sandy at the top and containing material of earlier 3rd century date. Their dark grey to black hue, with a yellow to green mottle, may suggest that this filling material is of a cessy nature. While it is possible that it functions as a cess pit or even a latrine at some point, its large size and shaft-like shape suggest that this is the upper part of a well. It appears to continue to accumulate material in its top into the 4th century (Period 5), which may further suggest that it is of significant depth and is continually settling over a protracted period of time. However, there is no sign of a wooden shaft or clay packing and the feature could just be a big rubbish pit. It cuts through rubbish pit 5828 and is adjacent to a further pit 13158 (see above), both of which are smaller and shallower. This pit/well also cuts the edge of Road 1 surface 5845 (Group 365 Period 3).